TacticalGearz Black Titanium Stainless Steel Folding Knife w/Sheath! Polished D2 Steel Blade! Ball Bearing Piviot System! ** TacticalGearz Classic StoneWashed Afro-american Titanium Stainless Steel Foldable Blade! Ball Bearing Unit to provide it an ultra soft quick available, Premium Shiny D2 Steel, Classic Style Blade. Blade is actually solid, soft as well as developed to last. Perfect size for EDC ... ...... Functions Include: StoneWashed District Clip, Ball Bearing Unit (offers it a fast soft non-friction available), Shiny D2 Steel Blade, Personalized Present Box & Sheath! ... ... ... Deal With Building: Afro-american Titanium Stainless Steel that has actually been gently stonewashed to provide it simply the correct amount from charm. Manage is actually textured for a tight grip ... ...... Blade: High Quality Shiny D2 Steel Classic Straight Advantage ... ... What is actually D2 Steel? ... D2 Tool Steel is actually a versatile high-carbon, high-chromium, air-hardening tool steel that is actually identified by a fairly high obtainable hardness as well as various, big, chromium-rich blend carbides in the microstructure. These carbides deliver good protection to wear from sliding exposure to various other metallics as well as abrasive components. TacticalGearz Classic Black StoneWashed Titanium Stainless Steel Folding Knife! Fast Ball Bearing Pivot System, Quality Polished D2 Steel Classic Style Blade! Knife is solid, smooth and built to last. Perfect size for EDC. Features Include: Real D2 Steel Blade! Frame Lock! StoneWashed, Belt Clip, Ball Bearing Pivot System (gives it a fast smooth non-friction open), Custom Gift Box & Sheath! Handle Construction: Black Titanium (TiN) over Stainless Steel that has been lightly stonewashed to give it just the right amount of appeal. Handle has textured scales for a tight grip. 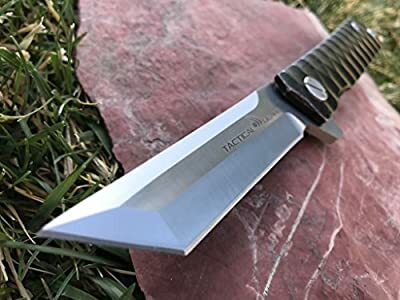 Blade: High Quality, Polished D2 Steel Classic Straight Edge, Hardness: 59-60HRC, Blade thickness: .16", Heat Treatment: Vacuum Blade Length: 3.25", Handle Length: 4.75", Overall Length: 8", Weight: 6.15oz, Package includes Custom Gift Box & Sheath!